When a tiny stage next to Liverpool's Cavern Club drew a crowd of thousands one bank holiday weekend, it was clear something special was taking place. Local band Alternative Radio were on the bill with several other acts, and 18,000 people had come to see them. The Mathew Street Music Festival was taking shape. This year, the two-day free music event is set to draw more than 300,000 people to watch live bands perform on five stages across the city centre. Dave Jones, who has been involved with the festival from its first year in 1992, said it has grown "exponentially" since then. He said the festival, which showcases local bands and a great many tribute acts, evolved out of International Beatle Week, which he has organised since 1986. But the bands were steered towards Mathew Street after Mr Jones took on the lease of the Cavern and wanted to encourage the crowds towards the club to spend their money there. In its first year in 1992, bands played at various venues in Mathew Street, but the following year the first outdoor stage was introduced. Mr Jones said: "We knew that we would get some people but we got 18,000 people, into the street. "We involved all the various bars and we supplied all the bands. It worked really well and it was a huge success. "We were amazed, it was a great day." He added: "The next year we decided we needed another stage, and we had a stage in North John Street, to cope with the 18,000 people, but we actually got 42,000 people." For the following few years, festival organisers were granted money from the European Regional Development Fund (ERDF) to help cover costs. 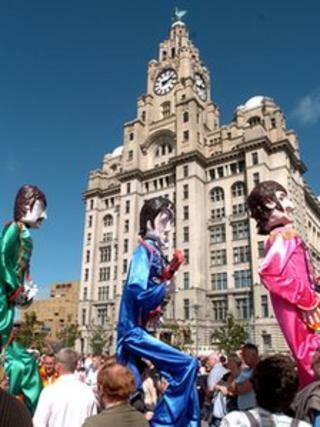 Today, it is organised by Liverpool City Council but Cavern Club directors Mr Jones and Bill Heckle remain in charge of the artistic content. It is an arrangement described by Mr Jones as "a great partnership", but one which is by no means certain, as the council deals with cuts to its budget. It has cut £50m from its budget this year and needs to find a further £21.6m in 2013-14. A council spokesman said no decision on funding the festival had been made but that it would be something it would be looking at closely. The event is the largest free music festival in Europe, with musicians from all around the world performing. Bands performing this Sunday and Monday include tributes to Queen and U2, as well as original bands from the 1960s such as The Merseybeats, Mike Pender's Searchers and Gerry and the Pacemakers. This year's event will celebrate the 50th anniversary of The Beatles, and many acts are expected to incorporate a Beatles element in their sets. Liverpool City Council's cabinet member for culture and tourism Wendy Simon said: "To attract bands from all over the world is a real testament to Mathew Street Music Festival, which is a much-loved event for the hundreds of thousands of music lovers who travel to Liverpool each year to enjoy this free, outdoor experience."